Saily Joshi grew up surrounded by role models who inspired her volunteerism. Her grandfather was a famous political freedom fighter in India; her parents were community and cultural leaders in Pittsburgh; and her father was a physician who provided free healthcare to patients in need. Saily carries on her family's tradition of volunteering at Brookdale Elementary School, where she is being recognized as the District 204 BMO Harris Bank Volunteer of the Month. For the past five years, she has been a member of the Parent Diversity Advisory Council, which is a parent advocacy organization that supports a diverse school community and is a community catalyst for the district's equity work. She has been the Brookdale PTA liaison to the Indian Prairie Parents Council for three years and recently was appointed as a board member at large. She recently helped plan a successful STEM (Science, Technology, Engineering and Mathematics) night at Brookdale that drew over 630 parents and students. In her role as a class parent, she plans parties and purchases gifts, but she also asks the teacher if there are children or parents who need a little bit of extra attention or a personal invitation to a school event, so every child feels special. She is also a ThinkGlobal Arts Foundation Board member, an organization that uses the arts to promote peace. BMO Harris Bank is helping District 204 recognize one volunteer each month who has generously given his or her time to support District 204’s students and schools. To celebrate these outstanding volunteers, BMO Harris Bank is donating $1,000 to the volunteer's school. To nominate an outstanding volunteer, visit http://ipsdweb.ipsd.org/Subpage.aspx/Volunteer. 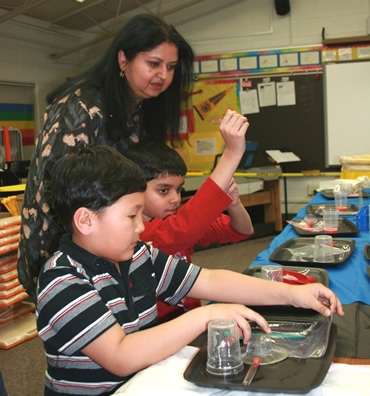 Saily Joshi assists two Brookdale Elementary students during the school's STEM night.